Wow, another great book! Dorothy H Hayes continues the fast-moving mystery thriller technique of Murder at the P&Z in Broken Window, as we follow Carol Rossi, an investigative reporter in her search for a missing 18-year-old girl, Kelly Singleton, in New York City. Kelly gets separated from her two friends on a subway car, and is missing when they get off at their destination, which begins the search for her, which in turn gets Rossi involved. We then follow Rossi in her exciting and dangerous search for Kelly. We won't tell you how the mystery ends, so you will have to read Broken Window for yourself to see the conclusion of what happens to Kelly. Rossi and her husband, Jerry, a detective, are vegans and live on Peaceable Kingdom, their farm animal sanctuary. 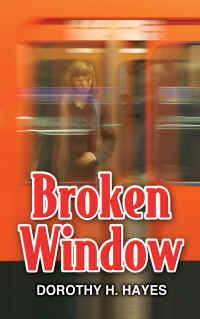 Broken Window is one of the Carol Rossi Mystery Series.